Within the project „Partnership for quality jobs and competitiveness“, the deadline for applying for participation in the training for active job search has been extended. The new application deadline is November 9, 2017. 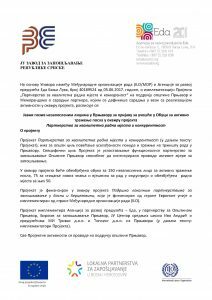 The training is free and it is intended for unemployed persons with a place of residence in the Municipality of Prnjavor, who are registered in the records of the Public Employment Service of the Employment Bureau – Biro Prnjavor as active jobseekers. The training, among other things, includes preparation of a biography, a motivational letter, and a job interview exercise. More information on applying is available in the public call which can be downloaded here.